Oil palm nursery in a Herakles Farm’s concession area. Photo: © Greenpeace/Alex Yallop. The potential for new laws governing the use of forest resources this year in Cameroon promises an opportunity to stem the rapid loss of forest in the biologically diverse country. 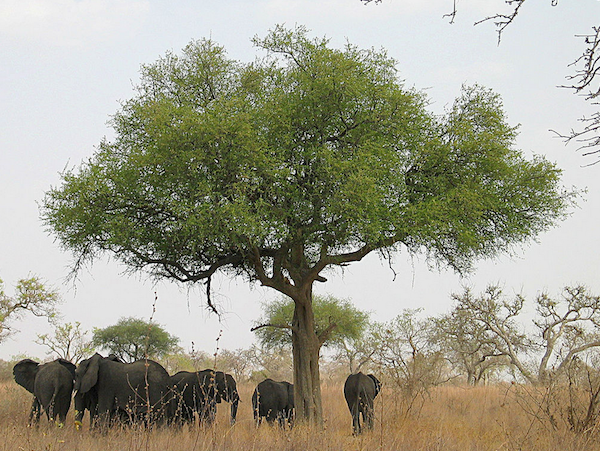 But the changes may ultimately not be what’s needed to save Cameroon’s forests. Cameroon is home to a plethora of species, such as forest elephants (Loxodonta cyclotis) and many different primates. Photo by Amcaja. In the late 1980s, the World Bank and International Monetary Fund started working with leaders in Cameroon to find more money to govern. “One way to do this in a country like Cameroon, where there was absolutely no industry, was to put the emphasis on exploitation of natural resources,” said Samuel Nguiffo, an environmental lawyer and founder and director of the Center for Environment and Development. So they changed forestry laws to encourage private investment in, among other things, the conversion of forest into fast-growing rows of oil palm trees. But since the regulations made it to the books in 1994, the tug of war over forestry resources has crescendoed between communities that were losing their land to outside interests, conservationists watching rich habitat for biodiversity evaporate, and private companies complaining about taxes that were too high. “After 20 years of implementation, [Cameroon’s forestry law] has proven its incapacity to appropriately manage conflicting interests around the forest,” Nguiffo told mongabay.com. The results of an ineffective system are born out by measures of forest loss, such as FORMA alerts, that show accelerating rates of deforestation in Cameroon. The FORMA – short for Forest Monitoring for Action – algorithm leverages NASA satellite data of dense tropical forest and identifies 25-hectare areas that have likely lost tree cover. What’s unique about these alerts is that they measure possible deforestation almost as soon as it happens. According to data from Global Forest Watch, Cameroon has seen an uptick in these alerts over the past few years, by 75 percent in 2012 and 67 percent in 2013, over 2010 levels. 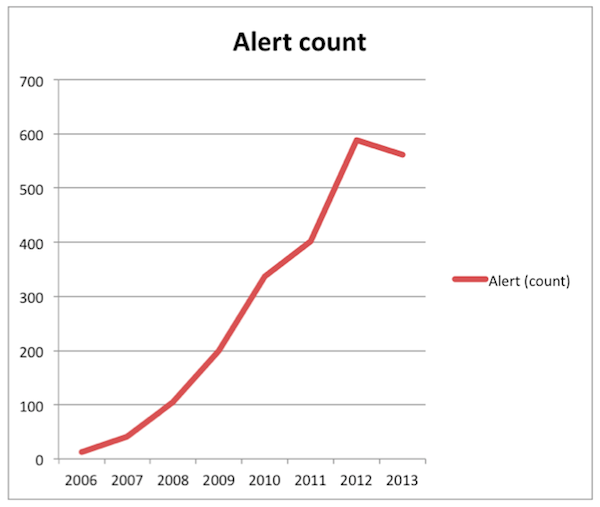 This year, however, alerts are on pace for a nearly 65 percent increase over last year. After a slight drop-off last year, FORMA alerts are set to continue trending upward in 2014. Graph by John C. Cannon, data courtesy of Global Forest Watch. But while the changes to Cameroon’s forestry laws could be an opportunity to give local communities more ownership over the lands they call home and standardize development to maximize economic benefits and environmental protection, Nguiffo said that in reality, they’ll put the onerous burden of proving ownership on communities before its members can harvest and sell products that come from the forest. What’s more, as they’re written now, they’ll likely make unchecked outside investment in the conversion of forest to farmland easier, Nguiffo said. “This is a major step back in forest legislation,” he added. Although there is still time for stakeholders to weigh in on the overhaul, Nguiffo doubts the law will end up incorporating meaningful changes for conservation before it’s voted on in parliament at the end of 2014. That leaves companies to police themselves or to be held to standards by independent boards like the RSPO – the Roundtable on Sustainable Palm Oil. According to Nguiffo, while this voluntary international body has brought important points to the forefront of the discussion of palm oil agriculture, it doesn’t have much power to enforce its recommendations and standards. “A certification board is great in theory,” Linder said. But often, it fails to hold companies that have signed on to the standard of sustainability, and can be a vehicle for green washing. He points to companies like Herakles Farms, an American investor accused by Greenpeace and other environmental watchdog groups of disregarding Cameroonian law. Foreign investors in other countries are guilty of using the RSPO as an advertising tool, Linder said, while not adhering to its recommendations for protecting existing forests. For example, the RSPO favors using “degraded” lands for oil palm plantations, but fails to provide a consistent definition of what the term means. “The whole RSPO rests on that definition [of degraded land], which makes the RSPO a bit silly,” added Linder. 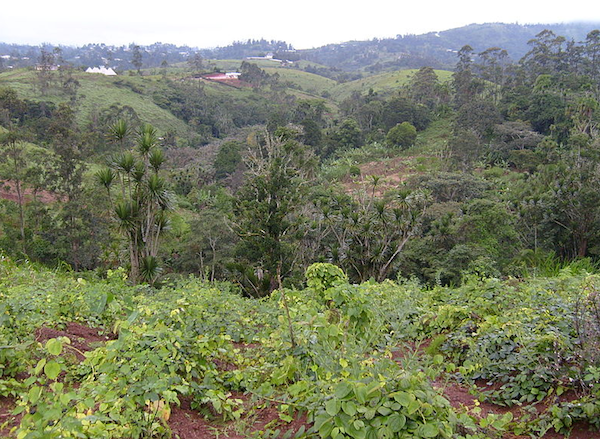 Mountainous Cameroonian countryside, much of which has been deforested. Photo by Trees for the Future. For scientists, the term “degraded” means it’s no longer the rich habitat it once was. But some companies apply the term a bit more liberally – for instance, to areas that might have been logged in the past but are in the process of developing back into important habitat. Linder works with scientists who have studied the land that Herakles considers degraded. 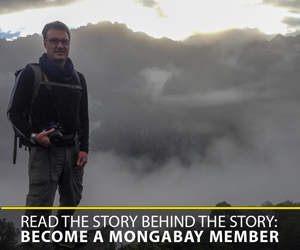 “They found that there were lots of threatened and endemic animals there, lots of good forests there, and in no way was it degraded,” he said. Linder fears that palm oil investors are turning their focus away from the depleted tropical forests of Southeast Asia and toward equatorial Africa, inciting something of a “new wave” of oil palm plantation expansion in jungle-rich Cameroon and making the Herakles development a harbinger of things to come. He wrote about the threats that this wave might have on primate diversity in a 2013 report for the journal African Primates. In the absence of a strong, conservation-directed national policy to govern oil palm expansion – something that Linder supports, if it’s done in the right way because of its vast economic potential – ill-conceived developments threaten to destroy more than just the forest where the plantation sits. FORMA alerts show that forest loss is presently occurring outside the boundaries of dedicated palm oil concessions (see map). Linder pointed out that palm oil plantations often bring with them a host of low-wage laborers. This could cause further deforestation as they may cut down trees to clear land for homes at the peripheries of the plantations. 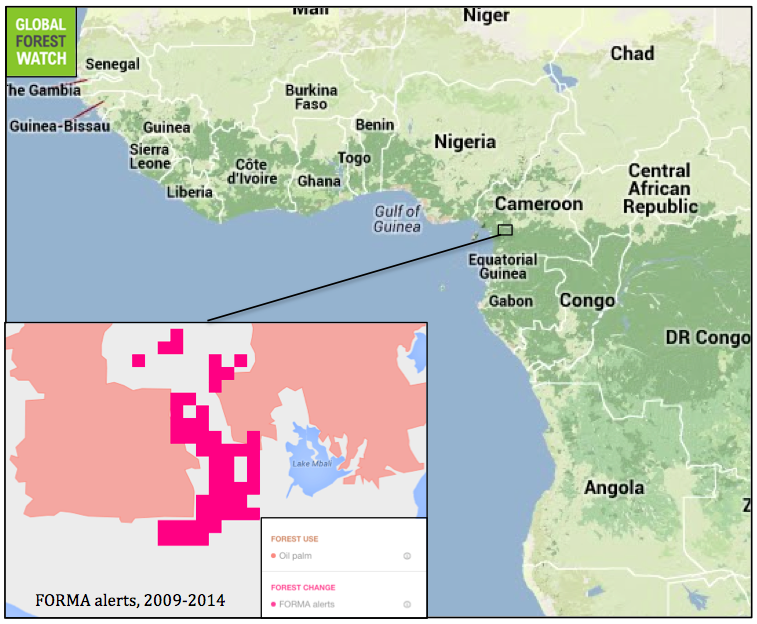 FORMA alerts identifying areas of probable forest loss in southern Cameroon between 2009 and 2014 show the tendency for deforestation to creep beyond the edges of oil palm plantations (accessed on 23 June 2014). Map courtesy of Global Forest Watch. Click to enlarge. Linder also is keenly aware of the responsibilities held by researchers with access to these areas to inform the public about what’s happening as a result of agricultural development for the world’s most popular vegetable oil. Rather than just serving as “historians for the decline of nature,” he said, scientists and conservationists have a duty to speak up about environmental destruction that so often goes unnoticed. But instead of simply offering criticism of Cameroonian policies, they can work with the country’s government to write reports, inform ministry leaders, and even change the laws and policies governing forest use. Given the changes in forestry law on the horizon for Cameroon, it seems the time may be right for that kind of involvement from the scientific community. (06/24/2014) A technology that uses discarded mobile phones to create a real-time alert system against logging and poaching will soon be deployed in the endangered rainforests of Central Africa. Rainforest Connection (RFCx), a San Francisco-based non-profit startup, is partnering with the Zoological Society of London (ZSL) to install its real-time anti-deforestation technology at sites in Cameroon. 30 RFCx devices — recycled from old Android handsets — will monitor 10,000 hectares or nearly 40 square miles of rainforest, listening for audio signals associated with logging and poaching. (05/28/2014) Greenpeace has just accused one of the world’s most controversial oil palm companies, Herakles Farms, of colluding with top government officials to sell off illegally logged timber to China. According to a new report, an agreement between Cameroon’s Minister of Forestry and Herkales Farms—through a shell company—could torpedo the country’s agreement with the EU for better timber management. (01/08/2014) Herakles Farms, an American agribusiness company, has been ordered to pay $4.6 million by a court in Cameroon over alleged discrimination in its hiring practices. 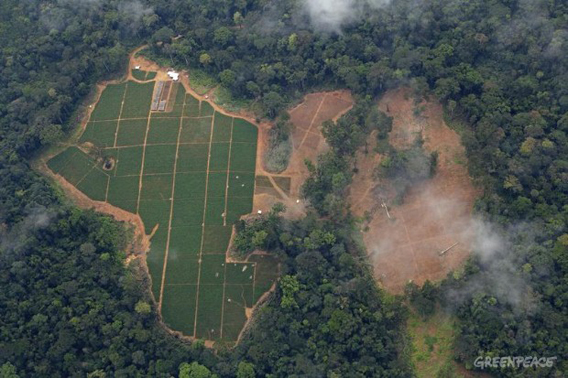 (11/26/2013) A controversial palm oil project set in the West African rainforest in Cameroon has won a three-year provisional lease to convert 20,000 hectares of land for plantations. The project, which is run by U.S.-based Herakles Farms, has been heavily opposed by environmental groups who say it will destroy blocks of wildlife-rich forest. (09/30/2013) In the Lower Basin of the Sanaga River in Cameroon, near Lake Ossa and the Douala-Edea National Parks, manatees swim and float about like round, potato-shaped mermaids. This region is home to the West African manatee (Trichechus senegalensis), an aquatic mammal facing a decline in population. Classed as Vulnerable by the IUCN Red List, the West African manatee is threatened by excessive kills, habitat loss, and habitat degradation. Given this, and the dearth of information about manatees, a group of Cameroon scientists have taken an ethnobiological approach (i.e. the interaction between people and wildlife) by employing skilled, knowledgable locals to collect data on the manatees. (09/18/2013) Environmental group, Greenpeace, has accused Herakles Farms of illegal logging in Cameroon after the company has already been lambasted by scientists and conservationists for its plan to build a 70,000 hectare palm oil plantation in one of Africa’s most biodiverse rainforests. Herakles Farms has been under fire from green groups—both in Cameroon and abroad—for years over its oil palm plantation plans, including facing protests from locals who live in the forest to be cleared. (08/08/2013) A biological survey of forests slated for destruction for a palm oil project in Cameroon has uncovered 23 species of large mammals, including the world’s most endangered chimpanzee subspecies, the Nigeria-Cameroon chimpanzee (Pan troglodytes ellioti). The project in question, operated by U.S.-based company Herakles Farms, has come under stiff criticism both locally and abroad for threatening one of Africa’s most biologically rich forest lands and arguably undercutting local peoples’ access to traditional lands.